Dry cleaning. Laundry. To Your Door. Download our App and Use code: 'DASHING10OFF' for $10 off your first order! PICKUP: Your friendly Dashing Valet will be assigned to assist you with your order and any questions you may have. 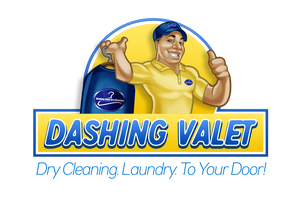 Dashing Valet deliveries are scheduled always between 7am and 8 pm. We provide SMS Tracking of our entire cleaning process, from point A to Point B. We offer pickup and delivery to commercial and residential customers!